How do I digitally remediate difficult heritage? What considerations do I take when I disseminate research on this incredibly sensitive topic, heritage that hurts? (…) Anyway, I’ve taken to calling my new job digital heritage on hard mode. This article attempts to address some of these questions through social media metrics and the online interactions of heritage institutions associated with difficult heritage: The Holocaust, 9/11, and the Trans-Atlantic Slave Trade, with a focus on the latter. Additionally, we looked into existing online communities surrounding difficult heritage that are independent of these larger institutions. Spoilers: there was little-to-no interactivity between official institutions and online places where people chose to “remember together.” Social media was used by official institutions purely to broadcast, not to interact. Institutions and experts were also pretty scarce where there was the most interaction, debate and arguably a need for an informed opinion. It’s a complete cliche online, but we ventured where nobody dares to go: THE COMMENTS. Authoritative voices are absent in non-specialist discussions of heritage online, as experts frame their conversations within official settings. The distributed network of the internet would seem to be an ideal venue for discussions with and between members of the diaspora formed by the descendants of the trans-Atlantic slave trade. Yet, there is little connectivity apparent on either websites or social media between academics, heritage interpreters, and the online stakeholder communities…identifying where meaningful performative collective memory is exercised, then engaging with stakeholders on their own terms, may be more impactful than websites or campaigns of outward-facing social media. Morgan, C., & Pallascio, P. M. (2015). Digital Media, Participatory Culture, and Difficult Heritage: Online Remediation and the Trans-Atlantic Slave Trade. Journal of African Diaspora Archaeology and Heritage, 4(3), 260–278. 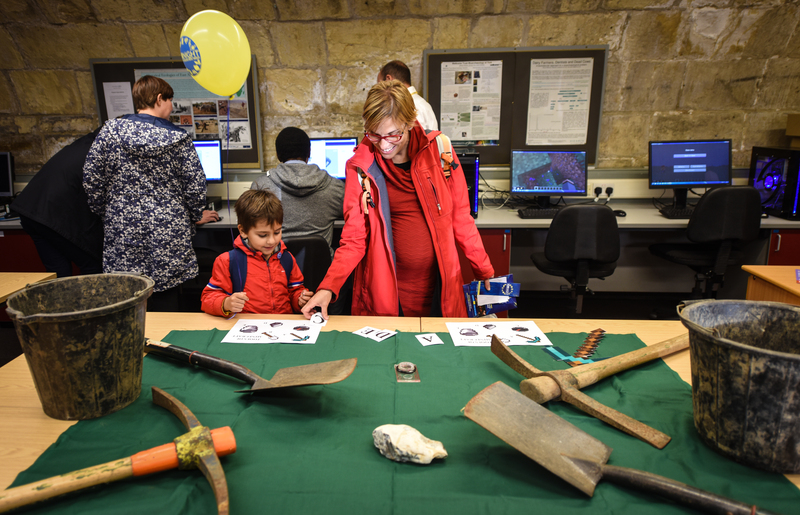 We ran a “Virtual Dig” event for Yornight again this year, refined and improved from last year’s effort. The event was wildly popular once again, and utterly wiped out the researchers participating. I re-structured the event so that there is something for each of our expected demographic–we had kids that had never played Minecraft who participated last year, as well as a few bored parents. We were able to address the former with a papercraft event, but as the papercraft was based around Breary Banks, we decided to eliminate it this year and focus primarily on Star Carr, for consistency across the activities. For the younger kids we expanded on our “real tools of Minecraft” event last year. It was very successful for connecting the analog world to the digital world, and gave us a way to talk about the spectrum of archaeological tools. Minecraft has pickaxes, shovels, buckets, a compass, and flint, and we had the kids match up the tools from a print-out. Of particular interest was the flint, as many children did not make the connection from the digital representation to the rocks in their backyard. I’ve uploaded a printable pdf of the Minecraft tools. I also made a sheet with a few letters that you can have the kids place next to the real tools. Feel free to steal the activity, but pleaaaaase tell me (colleen.morgan@york.ac.uk) if you do so I can show my department how useful it is to muck around with video games. We also had our usual server running with the Star Carr landscape installed, which I wrote about making last year. I actually had to re-make it this year in a single day, due to the old version accidentally getting wiped out. Ooops! Can you build a 10,000 year old house in Minecraft? For the older kids and adults we had Marie Curie Fellow Fabrizio Galeazzi present Star Carr data on his ADS viewer, to show the detailed visualizations of stratigraphy within a research database. 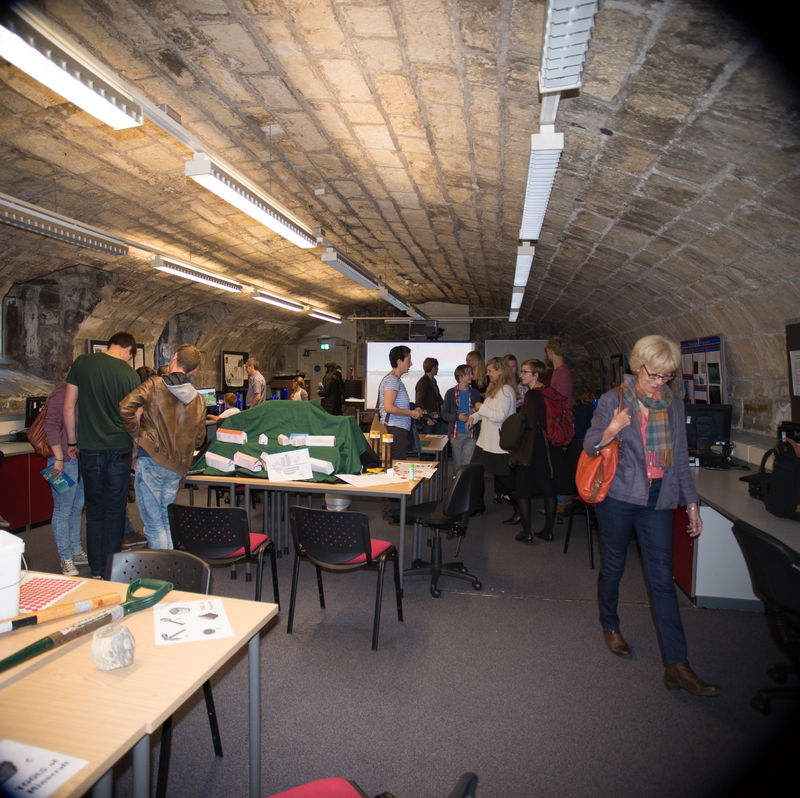 It was a great link for showing the research potential of archaeological visualizations. 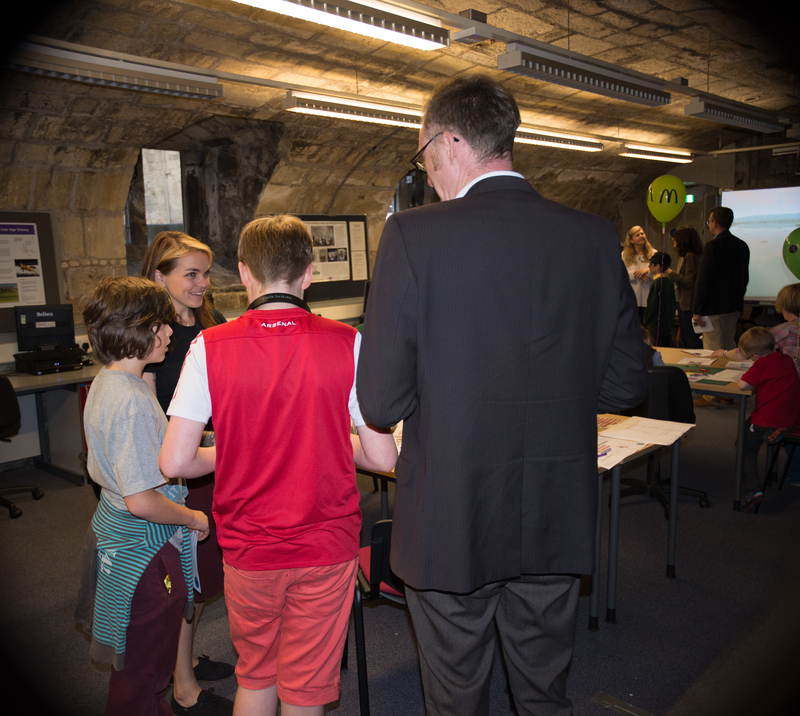 Overall it was chaotic but fun–we didn’t always have a chance to collar the kids with research before they started bashing through Minecraft. I’ve yet to have a chance to see what kind of carnage they enacted upon the Mesolithic landscape. I look forward to it though, as it’s an archaeology of its own. 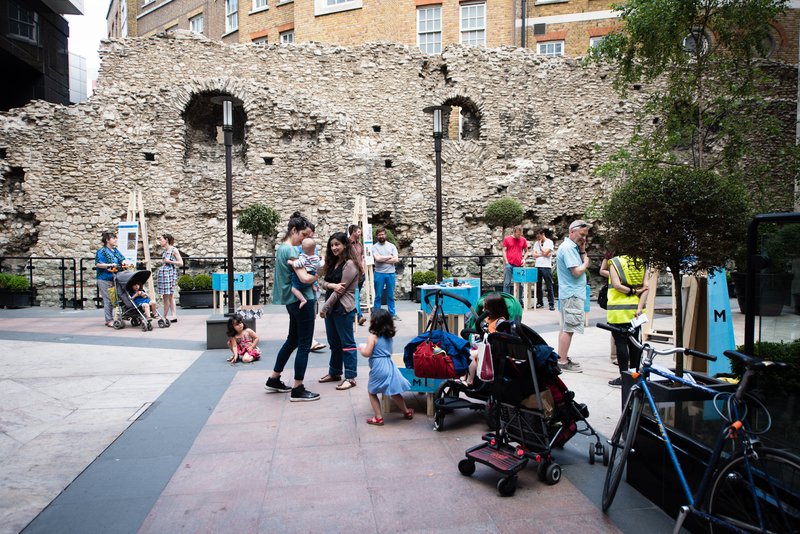 Florence Laino, one of our recent University of York Digital Heritage MSc graduates, has joined forced with L-P Archaeology in creating a Pop-Up Museum for the 100 Minories site near the tower of London. You may remember that Dan & I were involved in early testing at the site. L-P Archaeology had a previous pop-up museum, HIPUM on Hayling Island. We had a chance to check out the Pop-Up Museum a couple of weeks ago, and they’ve done an impressive job with temporary displays with finds from the site. The site was in the London city ditch, so all manner of artifacts came out of it. At the Pop-Up Museum, you can open up the displays and have a chat with the archaeologists who worked on site. The displays were impressive, and in a great location–right next to a standing part of the old city wall! The excavation was very close by as well, and Guy Hunt the director of the project was providing site tours. 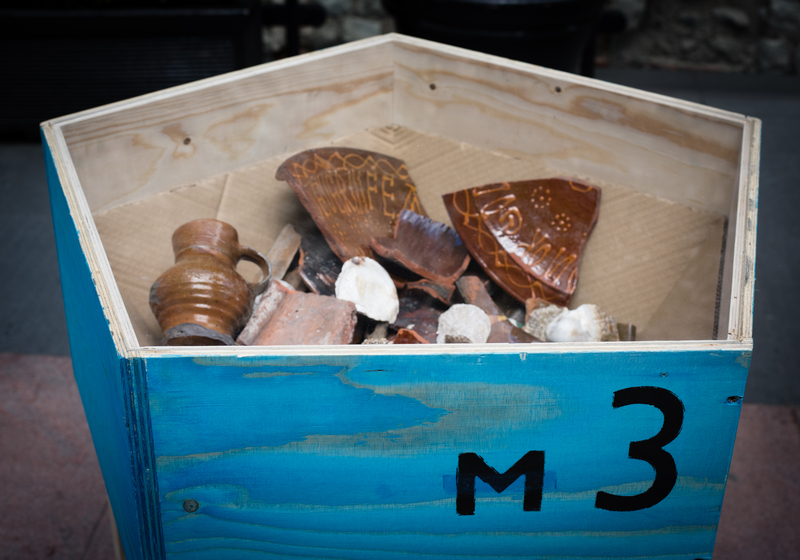 Author colleenmorganPosted on July 15, 2015 March 27, 2019 Categories ArchaeologyTags Archaeology, london, museums, pop-up museums, public archaeology1 Comment on Pop-Up Archaeology Museums! 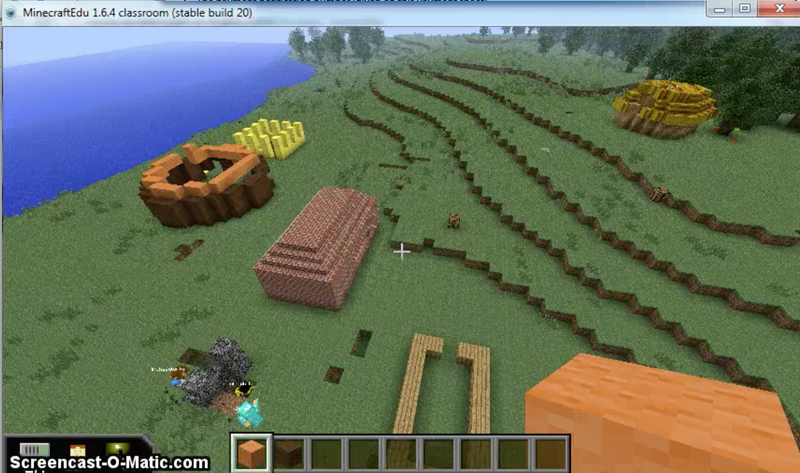 Archaeologists have been playing with Minecraft to present the past and the play around with reconstruction. 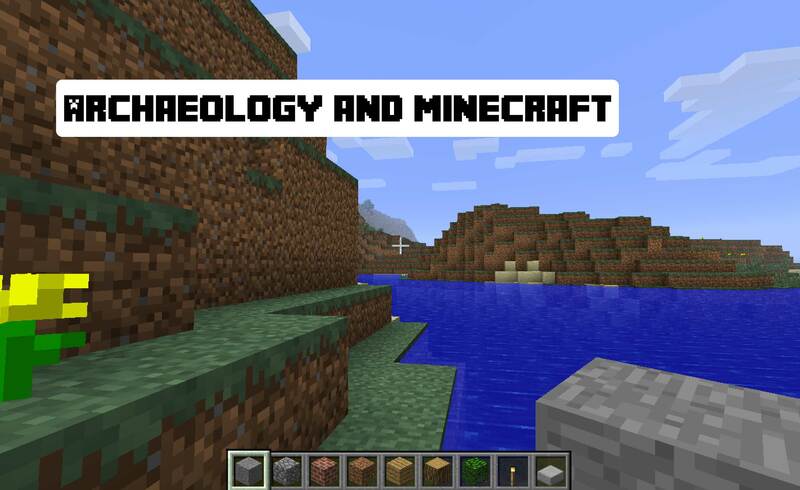 Shawn Graham, as always, is at the forefront of developing archaeological landscapes in Minecraft and if you’d like to try it out, I suggest you read up on Electric Archaeology. I used his instructions to import a digital elevation model (DEM) from the famous Mesolithic site of Star Carr, currently being investigated by Nicky Milner at the University of York. After a few tweaks, I managed to get a fairly nice, smooth landscape–Star Carr, now a lovely undulating field, was once on the edge of Lake Flixton. Organic materials such as wood preserve very well in the waterlogged peat and so they find lots of spear points, platforms and a deer frontlet or two. Red deer antler head-dress from Star Carr at the British Museum. Sadly we did not reconstruct the frontlets–building things in Minecraft is a lot like using Lego. Not fancy, specialist Lego like they have these days, but the basic set. So I got a reasonable model of Star Carr up and running for Yornight, which highlights European Union-funded research at York. I had a lot of help from other people in the department affiliated with the Centre for Digital Heritage. Well, archaeologists working at Star Car have found these circular houses with evidence of postholes, and we’ve made reconstructions based on that. But we aren’t actually sure what exactly the houses looked like. 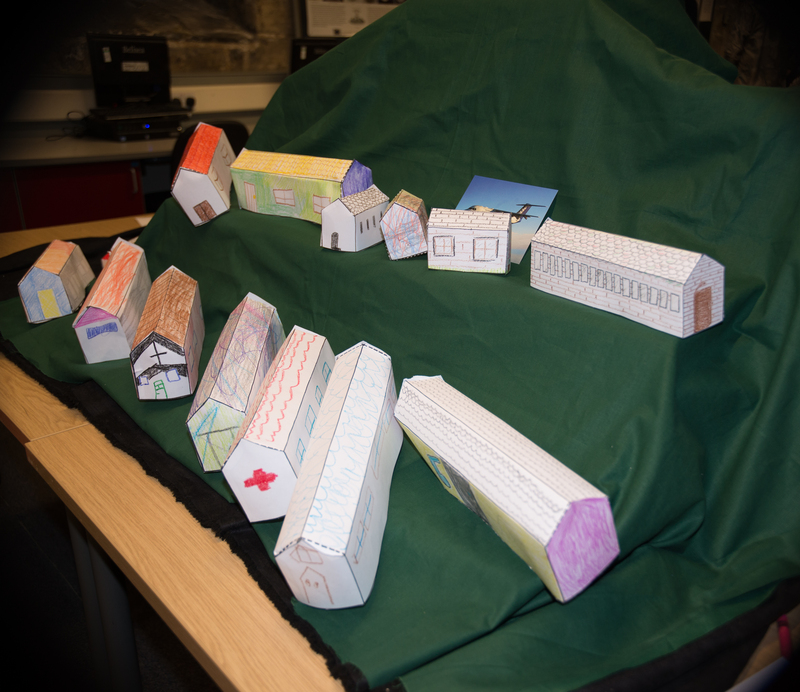 Can you help us think of different ways the houses might have looked? The virtual world of Star Carr! That was pretty much it. A few of the kids tried to build round houses, but as you may have guessed from the Lego-ness of Minecraft, they were still pretty blocky. Some built other houses, out of brick, some built giant flaming towers, and a few somehow made guns and started shooting at each other! I’d say it was a success. The dungeon-like barrel vault added to the atmosphere. We also had a papercraft Breary Banks, another University of York excavation site, and kids colored and cut out models of the camp. I found that having a mix of tactile and digital activities was more inclusive–kids didn’t have to feel forced into doing anything they weren’t used to or were uncomfortable with. Finally, we had the “real tools” of Minecraft, and that seemed, oddly, to be the most popular. It made the connection between tools that archaeologists used and the virtual tools in the game. We had a big nodule of flint, which is used in the game but many kids never made the connection to rocks. We’re running it again for the local Young Archaeologists Club and for the upcoming Yornight, which will also feature some experimental Oculus Rift visualization. Digital shenanigans continue apace!